Update, May 15. The whistleblowing document “Silence of the Deans” that got Dr Buckingham fired can be found here. Fuller background, including CAUT reaction, can be found here. This is a deplorable, almost unbelievable instance of hubris on the part of university management that deserves worldwide publicity and worldwide condemnation. I am reblogging here an article by colleagues at the University of Alberta, where I am a Professor Emeritus. I am also concerned as a Fellow of the Royal Society of Canada, whose duty as the country’s national academy is to do the utmost to protect academic freedom–including the freedom of deans, heads of department, and others occupying administrative positions to speak their minds on matters of legitimate public concern even when (and perhaps especially when) doing so may bring them into conflict with their own university management. Academic leadership requires academic integrity and the exercise of judgment, not blind obedience to authority on the model of Leninist party discipline. What is of concern here is not simply Professor Buckingham’s firing, but the attempted “gag” orders on deans discussing the university’s plans with colleagues, students or the public–that is to say, the main “stakeholders” involved–that he courageously defied. I would urge other FRSCs to condemn the University of Saskatchewan’s action in the strongest possible terms. Unfortunately I do not believe such administrative high-handedness or threats to academic freedom are confined to Canada or the University of Saskatchewan. Please publicize as widely as possible. 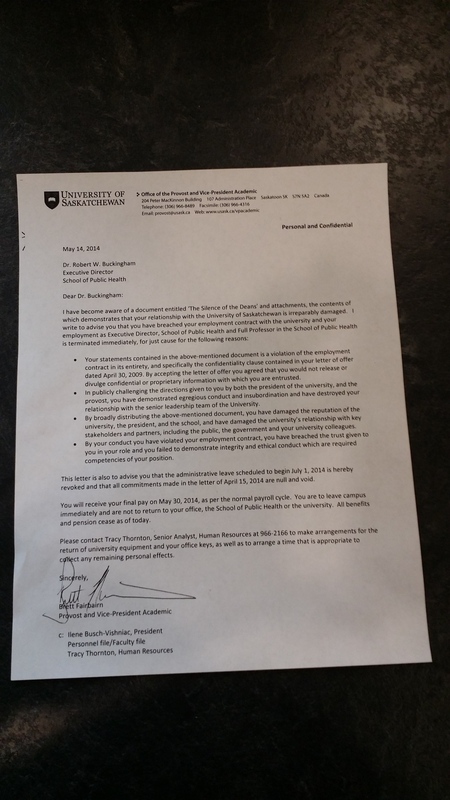 When I first saw the letter below circulating on Twitter as of mid-day, seemingly issued on the letterhead of the office of the Provost and VP Academic at the University of Saskatchewan and signed by the current occupant of those positions, Brett Fairbairn, I paused for a moment to question whether it was real. Could any Provost or VP Academic in Canada truly believe that s/he can charge a colleague with “egregious conduct and insubordination” for his or her expression of concern about decisions being taken by administrators at his or her institution, and issue the kind of summary judgment to which this letter speaks?